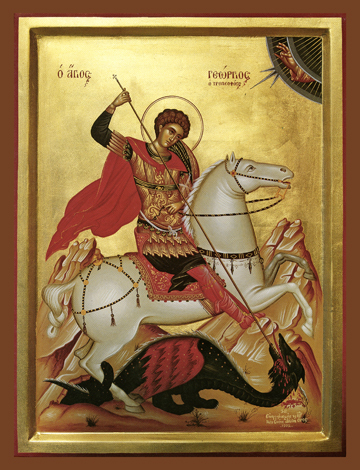 There are Saints in the Church who are known to answer prayers quickly through the power of Jesus Christ, and so are called “quick-to-hear.” St. George is one of these Saints, and is known and loved throughout the world. He was born in Cappadocia around 280 A.D. and moved to Palestine after his father, Gerontius, who was a well-known Roman soldier, was martyred for his faith when St. George was 14. When St. George grew up, he, too, entered the Roman army and was so successful as a soldier that he rose in a short period of time to become a Tribune of the Imperial Guard at Nicomedia, then the capital of the Roman Empire. In 302, the Emperor Diocletian began another wave of persecution against Christians and St. George bravely stood up to him, face to face, objecting to his edict demanding that every soldier had to make sacrifice to the pagan gods. For this he was prolongedly tortured. When in his martyrdom he raised a dead man to life, many believed in Christ, including the Empress Alexandra. The enraged Emperor ordered that both his wife and St. George be beheaded, and so they ascended to Heaven on April 23, 303.